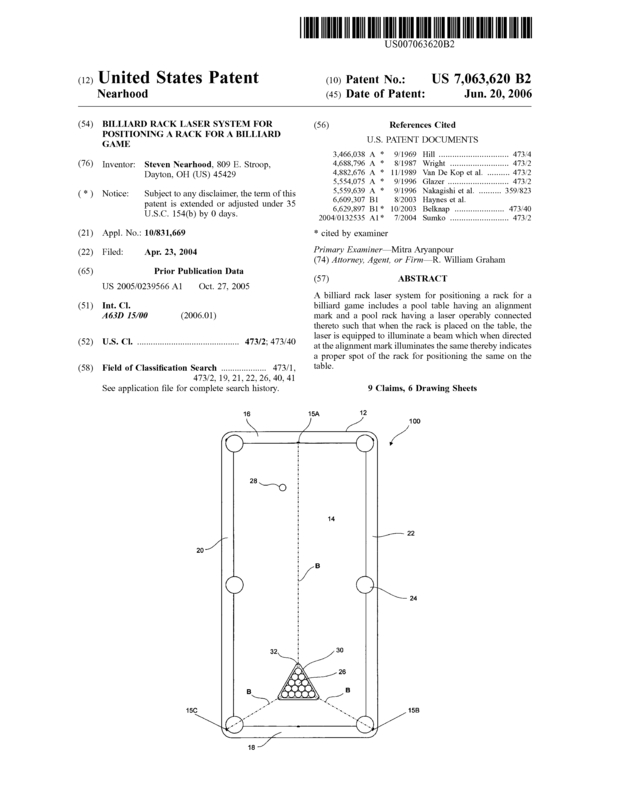 A billiard rack laser system for positioning a rack for a billiard game includes a pool table having an alignment mark and a pool rack having a laser operably connected thereto such that when the rack is placed on the table, the laser is equipped to illuminate a beam which when directed at the alignment mark illuminates the same thereby indicates a proper spot of the rack for positioning the same on the table. This new rack solves one of two age old arguments;.."a loose rack" and "a crooked rack", this invention totally solves the latter problem by assuring a perfectly straight postioning of the rack. I am looking to sell my Patent outright. There are multi-millions of pool tables in the would with many serious players. This product will improve any professionals game by up to 30%, and an average players game by up to 50%. But more importantly it assures a perfect rack to begin a truely fair game. Page created at 2019-04-25 18:07:15, Patent Auction Time.